President Trump and his administration are buckling in for Hurricane Florence, a Category 4 hurricane expected to slam into the Carolinas by Friday. Experts are saying Florence, a "monster," could be one of the most powerful storms to ever hit the East Coast. President Trump is receiving regular updates on the situation. Yesterday Homeland Secretary Kirstjen Nielsen and FEMA Administrator Brock Long were at the White House to break down the federal government's preparedness plan. 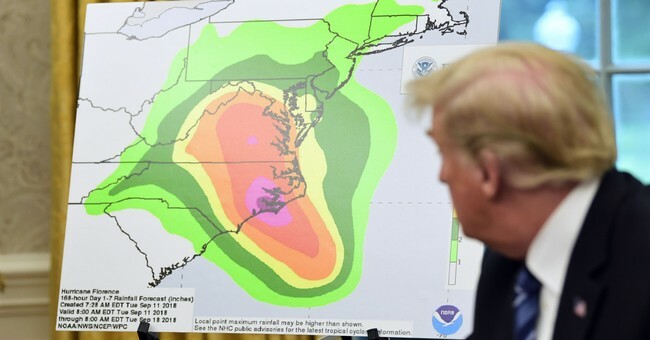 The entire coastlines of North and South Carolina, in addition to some parts of southeastern Virginia, are under a mandatory evacuation plan. "Unfortunately, Hurricane Florence is setting out to be a devastating event to the Carolinas, and potentially Virginia as well. So as you can see, they're forecasting a major landfalling storm -- Category 3 or 4 storm at landfall. The biggest hazard that we're worried about is storm surge," Long said. "That's the primary driver of the evacuations that are underway by the states of North Carolina, South Carolina, and Virginia right now. But as this system comes in and makes landfall, during the weekend it's forecast to stall out, lose its strength and its steering currents, and drop copious amounts of rainfall." "This has an opportunity of being a very devastating storm. The power is going to be off for weeks. You're going to be displaced from your home in the coastal areas. And there will be flooding in the inland areas as well. So these are going to be statewide events. The hazards will be statewide," Long continued. Meanwhile, those choosing to ride out the storm in evacuation zones are being told first responders will not be available to help them once Florence makes landfall.